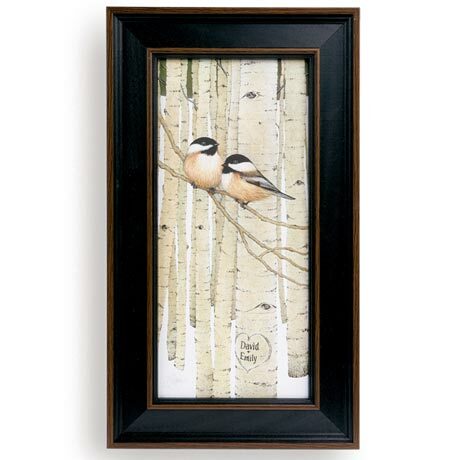 Two chickadees perch on an aspen limb above a heart with two names inside. A romantic image by artist Scott Kennedy is printed on fine-art canvas, hand-signed, hand-personalized with the names of your choice, and framed in wood. Accompanied by a poem ("Two souls. Two hearts. Made as one by God... Forever in love"). Narrow version (10" x 17 1/2") comes with a copy of the poem. For each, specify up to 10 letters per name and allow 2 to 3 weeks for delivery. No rush delivery or gift box. --Two souls/ Two hearts/ Made as One by God/ Friends Lovers/ Soul Mates/ Intertwined together for/ the Journey/ Joined in Spirit/ Growing in Depth/ Honored by Heaven// In one another/ Finding delight/ With one another/ Seeking the highest good/ For one another/ Laying down their lives// Pure in Devotion/ Unmoved in Loyalty/ Bound by Trust/ Led by Hope/ Committed to Truth/ Wrapped in Grace// Forever in Love Item can only be shipped within the Continental US.